Is bigger better all the time? 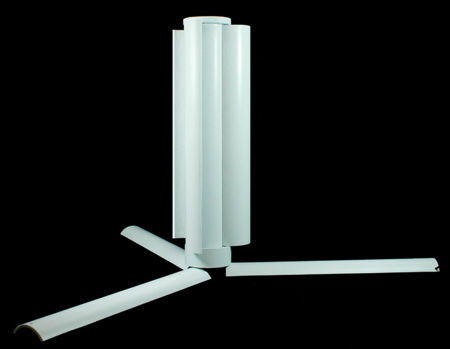 Not necessarily so, but this has not stopped Skajaquoda from introducing a larger Trinity portable wind turbine model to the masses, calling it the Trinity 100. What makes the Trinity 100 so special? For starters, it comes with a 100W generator as well as a built-in battery which is capable of holding a massive 30,000mAh of juice when fully charged, and is also ideal for the frequent traveler considering how it can be folded together into a 20 inch cylinder which can be carried around easily, anywhere. In fact, the Trinity 100 tips the scales at a mere 6 lbs and 5 lbs sans the removable internal battery. Located at the bottom of the Trinity 100 would be a 110V output with EU/UK/US wall plug/adapter that lets you charge your devices. Not only that, it also comes with a 5V 1A USB and 5V 2.1A USB output, in addition to an input which lets you charge Trinity’s internal battery in a wall socket. Using the Trinity 100 is a snap – all that you need to do is to pull out the aluminum legs and arrange them in either a tripod configuration or laid flat, depending on your circumstances, and let nature do the rest of the hard work.